I am so happy to be spreading the word about a very exciting benefit for Project Philippines! 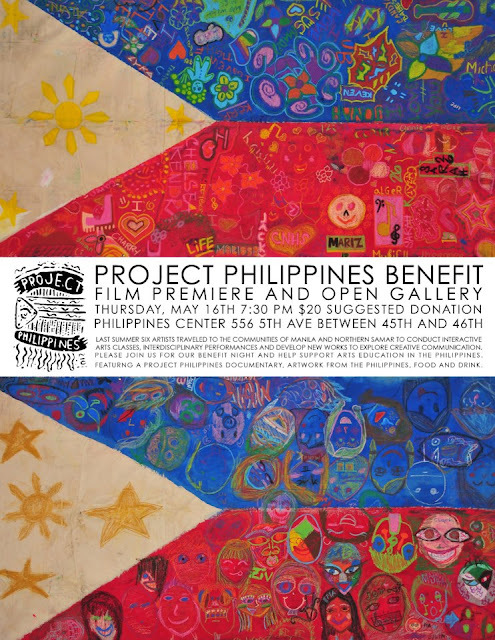 On May 16 at 7:30 we will be premiering our documentary about the project last June as well as displaying art work and journal entries by our students throughout the Philippine Center (556 5th Ave. between 45th and 46th St.). Following the premiere, we will have a question and answer session with a representative from Artists Striving to End Poverty, and of course, refreshments. Suggested donation is $20 and $10 for students and children. All proceeds from the event will go toward our next trip, Project Philippines 2014! Check out the trailer for the film here: https://vimeo.com/49650973. This night is going to be very special for me. I still remember so vividly the radiance of every student and I am so thrilled we are able to share their beauty with our donors and the rest of the community here. I really can't wait for this event.